I’m a bit late with this one… oooooh about… *counts on fingers*… 8 months late? Anyway… this was really doing the blog rounds back when Spring had barely sprung. And I have to say… I don’t really get it? I was expecting to see some magnificent colour shifting between the teal and green and there was nothing. Ok, so it was slightly more green in some light, but really? You U.S girls didn’t miss that much. A true blackened colour, Mr. L had a hard time believing it was infact anything other than black polish on my tips. Sparkle was VERY well hidden and the whole manicure looked a lot flatter than I had hoped it would. Application wasn’t too problematic… 2 coats with a brush that was a little too firm for me. The streaking on the first coat shocked me, the brush practically drags the polish across the nail bed. A thicker 2nd coat solved this though. Wear on Lancome’s Pop Petrol has been decent enough, no chips until the third day and tip wear (despite the v. dark colour) has been negligible. This is a polish that I picked up from a counter bargain bucket last week. Lancome are obviously shifting the last of their Spring collection, so if you wanted to get your hands on a shade that would happily suit Autumn/Winter – now’s the time to do it! Original price £14.50, I paid half that. 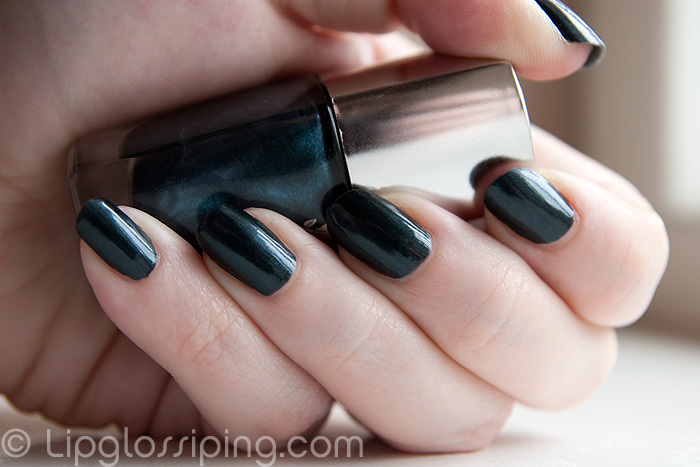 Would you believe it to be comparable to the dark Estee blue dahlia polish? That’s a dark blue black, too right? Glad I gave it a miss. Thanks for this. It’s important to know what NOT to get. Isn’t it just? It’s one of those where I’ve so many other lovely shades… I doubt I’ll ever bother wearing again yano? I love your blog so that’s why I tagged you in my Sweet Blog award’s! Looks nice though. Know what you mean about hoping for more of the green and I suppose being “petrol” you might expect a bit of oil on water. That’s it! I just thought with a name like Petrol… it should have delivered more. It’d be like calling a nail polish “bluebottle” and then just making it blue. BLAH!